PDF converters have always been very popular tools in the office. Converting PDFs into more editable formats like Microsoft Word or Excel is a must for many people who regularly receive information in the form of a PDF that needs to be edited further and analyzed. And since PDFs can’t be edited, the best thing to do in such a situation is to convert them into a more editable format in order to free the trapped data. One of the most popular names in professional PDF conversion solutions is Investintech.com. The company’s Able2Extract software is among the most powerful and popular on the market when it comes to professional PDF conversion tools. The Able2Extract name has recently expanded its services to the mobile market, and now offers free PDF conversion tools for Android mobile device users. There are no strings attached. 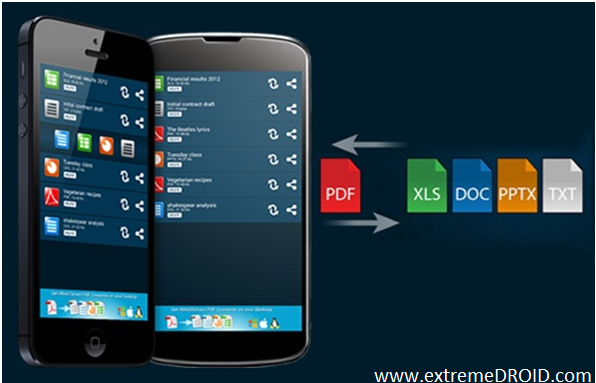 The Able2Extract PDF converter mobile app can be downloaded for free from the Google Play Store. You can also get them from Investintech’s own site. The app’s interface is very easy to understand and navigate, so even if you’ve never used a PDF conversion tool online or on mobile, you won’t have much of an issue using this application. It’s also designed to work on any Android or iOS device you own, whether it’s a phone or a tablet. While Able2Extract Mobile might not give you all of the conversion options you get from the desktop software, all of the most popular ones are supported. You can use the app to convert PDFs into editable Excel, PowerPoint, Word and text files. Furthermore, you can reverse the process and turn those file types into PDFs with the app as well. It’s safe to say that it will probably be the only file conversion app you will ever need to install on your mobile device. Since the mobile app operates with the same high-end technology used by the Able2Extract desktop software, you can expect accurate conversions every time that perfectly mirror the formatting of the original content. These conversions are not being performed by the app itself. The app sends the files to the Investintech online servers, where the conversion is completed. This means that the conversion process will not slow down your mobile device or drain your battery drastically. With one quick tap, you can share and send your converted files to friends and colleagues. Both your original and converted files are deleted from the servers after a period of 24 hours. Furthermore, you’ll never have to give your email address or any other personal information in order to use the app. The conversion process couldn’t be any simpler. All it takes is two taps. 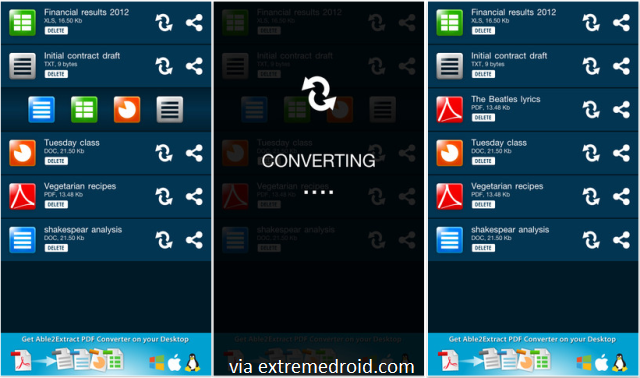 Simply long-tap any file you want to have converted and then send it to the Able2Extract Mobile app. Once it appears in the file list, tap the conversion option you desire. And that’s all there is to it. The newly converted file will appear on your file list once the process is completed.